"Re-incarnation into a Hallucinogenic World"
Kudos from the co-founders of Art Kudos: "Aradhna's painting style is refreshingly unaffected. We are drawn to her storytelling and her vibrant use of color. She paints in a primitive style, but her complex understanding of the principles of art is apparent. 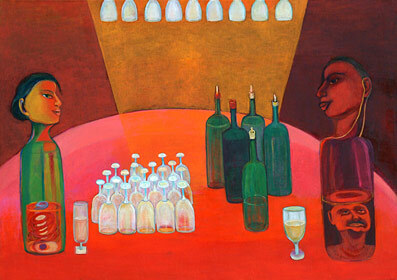 The repetition of shapes with varying color temperatures creates a wonderful rhythm while the round table and symmetrical composition provide strong unity and keep the viewer's eye focused on the central figures whose lives are made transparent before us."